Light, airy and air-conditioned, well-designed home offers open living/dining area plus adjacent, yet separate den/tv room. 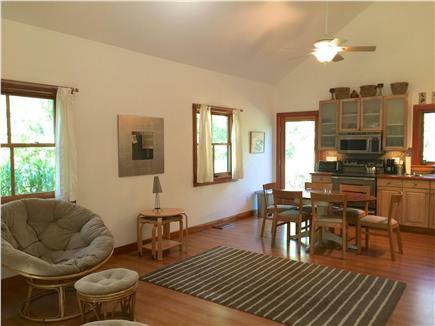 Sleeping options abound, with master bedroom, bunkroom that sleeps 3, and over-sized loft/sitting room for additional sleeping area or a great place to read and relax while the sun streams in through clear-story windows. 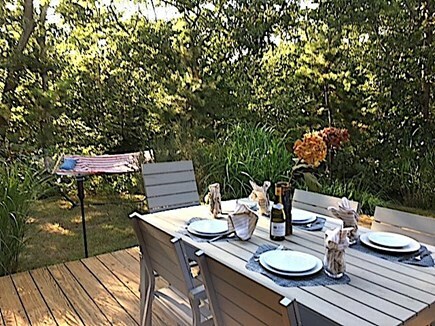 Spacious outdoor deck, with dining table for six, separate sitting area, enclosed outdoor shower, large grassy lawn plus private wooded location make outdoor living a pleasure. Great mid-island location enables ease of travel to any Island town. 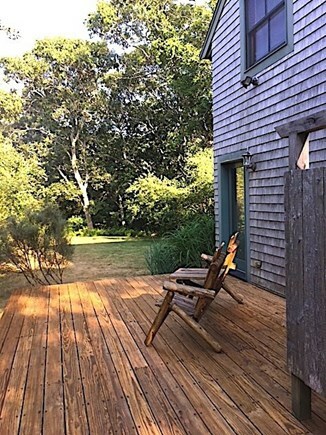 Easy access to two of the Island's finest beaches (Lambert's Cove and Longpoint) plus bike path at the end of the lane winding through the state forest make this property the perfect Island getaway. Long-Term Rental (1 month or more): Off-season weekly, monthly and long weekends available, with price to be determined based on length of stay and time of year. 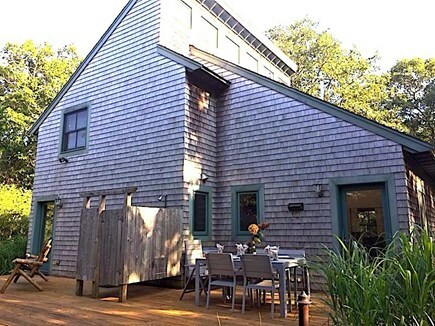 My husband and I stayed at Bruce and Deb's house in West Tisbury for a month. The house is warm and inviting. We loved the décor. As we entered the green doorway there rested two fabulous reading chairs! This home is ideal for the writer, the artist, the hiker, the biker and the thinker. It also provides wireless cable and TV so one can still partake of electronic devices and distractions. The three bedrooms are impeccable. The house shouts wood; large wooden windows framed the green flora and the sunlight dappled the home through skylights and high ceilings. Their house is nestled on a unique piece of property. A forest border and a circular enclave of green grass beckons one to rest on the bench or to utilize the reclining beach chairs provided--Arcadian like. Stepping onto the cedar porch and lying in the hammock--reduced all stressors and one feels like they strolled into a Yeat's poem: For Peace comes dropping slowly. The bike path interconnected the island and is situated at the end of this road. My husband and I rode daily. We had our road bikes and our mountain bikes and our hiking shoes. The island is a biker's paradise. For road bikers--bike down Middle Road to the West Basin and take the bike ferry across. The views on Middle Road consist of stonewalls, fresh ponds, rolling hills, pastoral sheep and ocean views. Stop at the Mermaid Farm! Hikers and bikers pick up the local Hiking Book in Edgartown; it was indeed our compass to outdoor ventures. The beaches take your breath away! 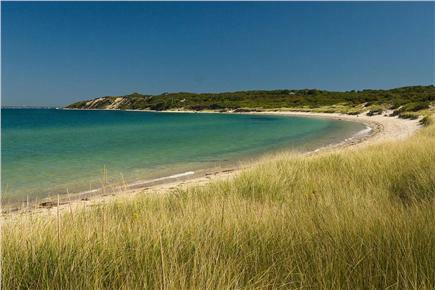 Aquinnah was my go-to spot. The gold, clay, and limestone cliffs looked moon like. In addition, Lucy Vincent Beach has nature induced monolithic sights--king of conglomerates or Hoodoos! Astounding! Lambert's Cove is peace. The island abounds with fresh ponds, bays, sound, and ocean delight. Equally important, are the shopping and restaurants which are amazing. Dine Italian in Vineyard Haven and check out Oysters 19 in Edgartown. 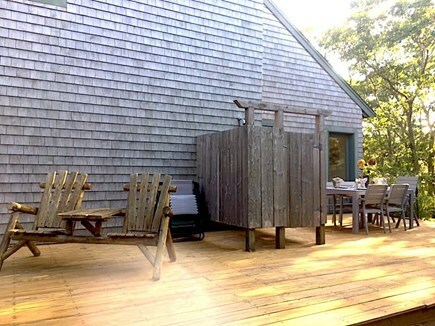 If you seek privacy, comfort, and a cool-warming décor, Bruce and Deb's place is the one to chill in--and soak up everything Martha's Vineyard has to offer! We were so lucky to have discovered their home. Thank you so much for sharing it with us! This house was perfect in so many ways. My family had a fantastic time on the Vineyard, thanks to staying here. Well equipped kitchen. Comfortable beds. Wonderful layout for a family. Spacious rooms. Clean. Serene. Lots of privacy. 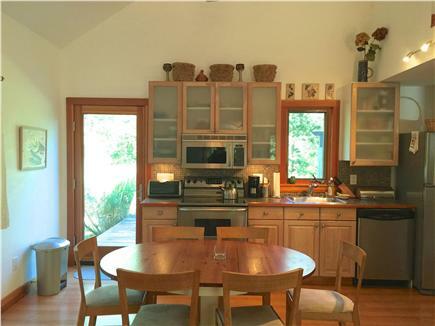 Close to everything we needed in West Tisbury, Vineyard Haven, and Edgartown. A large yard to fit a volleyball court. And... our favorite: the most pleasant temperature control! To add to it all, Bruce is a very responsive landlord. Every minute of the stay was a pleasure.